A Lympstone couple have received national recognition of their charity efforts raising over £20,000 for the Exmouth RNLI. A presentation to Alan & Sally Burton took place last Saturday 14th July following their raising of over £20,000 in Lympstone for the RNLI. The Booksill, which has been running for 14 years, offers for sale unwanted books generously supplied by Lympstone Villagers on a window sill in the centre of the Village. Alan & Sally also support other RNLI fundraising initiatives, and Alan first started working with the charity 45 years ago. 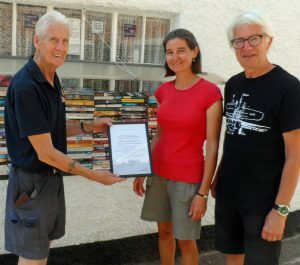 Their RNLI ‘Excellence in Volunteering’ Award, issued by the Chairman and Council of the Royal National Lifeboat Institution, cites the couples ‘dedicated efforts in raising over £20,000’ and their ‘time and energy given to running the Booksill in Lympstone’. Photograph : Alan & Sally Burton receive their certificate from Chairman of the Exmouth RNLI Fundraising Committee, Don Hodgkinson. L to R : Don Hodgkinson, Sally Burton, Alan Burton. All photographs credited Exmouth RNLI.